So, my intentions were to always write a music review with a wine review, but I found an amazing wine that I had to share ASAP. Lets just say I owe you a music review. To begin, this wine blew me away. What is even more impressive is the under $20 price point. When I say run and get this wine, do it! Trust me. It will disappear very fast. This remarkable French wine is from the South of France from a vineyard located very close to the Mediterranean Sea. It is composed of 60% Grenache, 30% Syrah and 10% Carignan. From my research this vintage was aged for 8 -10 months in oak barrels and only 1200 cases were made. This wine can be enjoyed now or saved for a few years. This wine is a smooth operator. Perfectly balanced and velvety in my mouth with no bite at all. A perfect wine for those beginning venturing into reds. Before reading anything about this wine, I could taste some of the minerals from the soil. Then after reading the back of the bottle I knew it had something to do with the proximity to the sea. It is amazing when you can taste geography; it comes through in this wine. Other flavors that came to mind were dark fruit berries and a touch of nuts. The nose was a bit weak, but the taste and finish made up for it. I think this wine will taste even better after an hour or two decant, something I should have done. 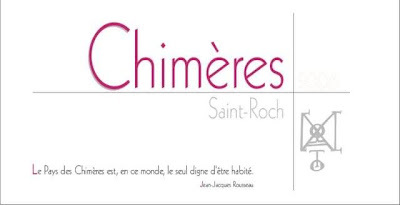 I highly recommend Château Saint-Roch Côtes du Roussillon Chimères 2006. It is available, but not for long once word gets out. 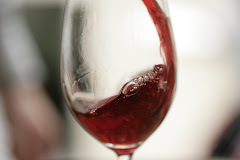 Please give me your feedback, I would love to hear what you think of this wine and my blog.